Revisions up to and including hrev46677 boot properly for me. But hrev46732 and above boot as far as the rocket and then just hang there. I'll attach my listdev output and syslog(s) from my working hrev46677 install. listdev.txt​ (4.8 KB) - added by jstressman 5 years ago. syslog.old​ (512.0 KB) - added by jstressman 5 years ago. syslog.txt​ (481.4 KB) - added by jstressman 5 years ago. 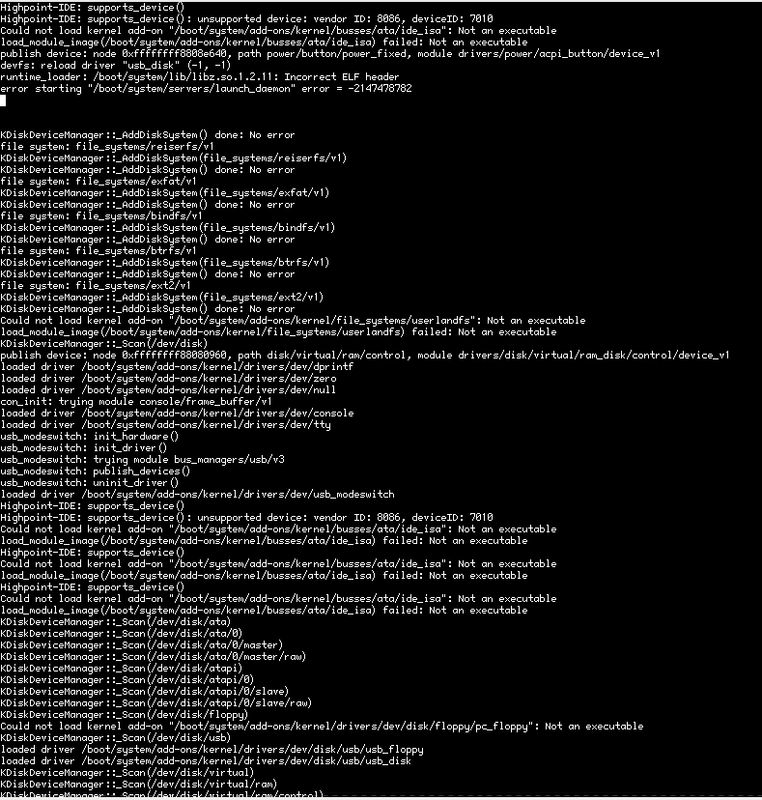 Second "half" of the syslog. See syslog.old for the first "half". Still an issue, according to jstressman on IRC. But it doesn't stop the boot, oddly enough. Could you bisect further to find the exact revision that causes the problem? You'll have to build those revisions yourself. Without a more specific revision, there's currently no information that specifically implicates the kernel. That stage of boot is when all the userland servers are being loaded anyways. I'll see if I can track down a more specific revision. But in the meantime I accidentally stumbled across a work-around. I plugged in a USB SD card adapter while it was sitting there frozen at the previously mentioned /etc/shadow line, and suddenly the boot resumed and finished successfully. I tried it with just the USB adapter, without the SD card plugged into it, and it only registers the device.... then goes no further, even if you add the SD card, plug and unplug, etc. Nothing after that no matter what. It needs the SD card in the adapter. Next I'll see if I can track this down to a specific revision. There're a lot of Last message repeated x times messages in your syslog. But I couldn't find which message it actually is. In any way, it sounds like a problem with usb drivers. I have no idea how this has led to the /etc/shadow error, but it appears to be the problematic revision. The CPU up through hrev46689 would idle between 0 and 2%... almost flatline... but starting with hrev46690, it will spike every few seconds for anywhere from half a second to a few seconds during which the system basically freezes. This makes the system almost unusable for getting any work done. I'll attach screenshots of ActivityMonitor on a fresh boot of hrev46689 and the latest nightly hrev48579 (which behaves the same as hrev46690). These are both just sitting totally idle with nothing else running. I don't think the "/etc/shadow" error has anything to do with this (it appears in the good syslogs too) it just happens to be the last thing to happen before CPU-idle kicks in. KERN: Last message repeated 20 times. The KERN prefixed ones are from the kernel. The first repeat is the repeat indicator of the last kernel log message (the wifi one). The unprefixed one is the repeat indicator of the syslog daemon. In this case the kernel repeat of 20 is itself repeated twice. In an otherwise idle system this does not look problematic. As noted above the "/etc/shadow" message is normal. The shadow password file is only created if you actually set a password for your user or create other users. As a side note: From reading the syslog it looks like you are running your disk controller in IDE/compatibility mode which, except for actual compatibility with already installed other OSes that require it, is rather suboptimal. Using AHCI mode reduces the overhead of disk IO greatly. The actual problem is unfortunately still hard to diagnose with the given revision. Even though it is only a single hrev, it points to a merge commit that brings in a lot of changes at once. Note also that there were some issues with the merged scheduler branch early on that only got exposed on certain hardware and were subsequently fixed in later hrevs. Ideally you could bisect the scheduler branch itself, to find the commit within that first caused these symptoms. Unfortunately there are no pre-built images of that branch AFAIR. Actually, look at the commit that Git listed as causing the issue: it's not the scheduler merge itself, it's one of the commits that was included in the merge. Looks like Git was smart enough to figure out there was a merge, and bisected everything in the merge, too. Almost all of the bisections after the initial one seemed to focus on hrev46690 (unless I was reading the logs wrong?). I have no problem building images and testing them etc. I just might need help finding my way around git (as folks have helpfully provided thus far). That makes sense -- IIRC, Pawel branched master off for his scheduler work at hrev46160, so -148 means 148 commits into his scheduler branch. Does the CPUIdle module count as the "power" module? AFAIK, it's really part of the scheduler. jstressman, any updates on this one? Have you been able to bisect it any further? As seen in comment:6, the problem is the new power module. Since nobody (or at least very few?) others has reported this issue on their hardware, moving out of beta1 milestone as low-priority. libz.so is somehow got corrupted which broke loading launch_daemon.